Last year, the startup company Pivotal Commware secured venture capital (e.g., from Bill Gates) to bring its holographic beamforming technology to commercial products. Despite the word “holographic”, this is not a technology focused on visual-light communications. Instead, the company uses passive electronically steered antennas (PESAs) that are designed for radio-frequencies (RFs) in the micro- and millimeter-wave bands. It is the impedance pattern created in the distribution network over the array that is called a “hologram” and different holograms lead to beamforming in different spatial directions. The company reportedly aims at having commercial products ready this year. 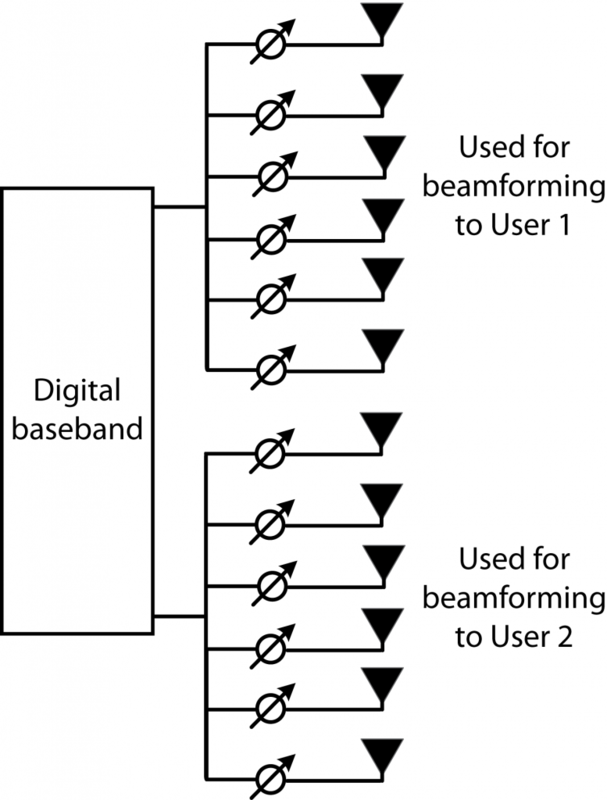 Will the futuristic-sounding holographic beamforming make Massive MIMO obsolete? Not at all, because this is a new implementation architecture, not a new beamforming scheme or spatial multiplexing method. According to the company’s own white paper, the goal is to deliver “a new dynamic beamforming technique using a Software Defined Antenna (SDA) that employs the lowest C-SWaP (Cost, Size, Weight, and Power)“. Simply speaking, it is a way to implement a phased array in a thin, conformable, and affordable way. The PESAs are constructed using high volume commercial off-the-shelf components. Each PESA has a single RF-input and a distribution network that is used to vary the directivity of the beamforming. 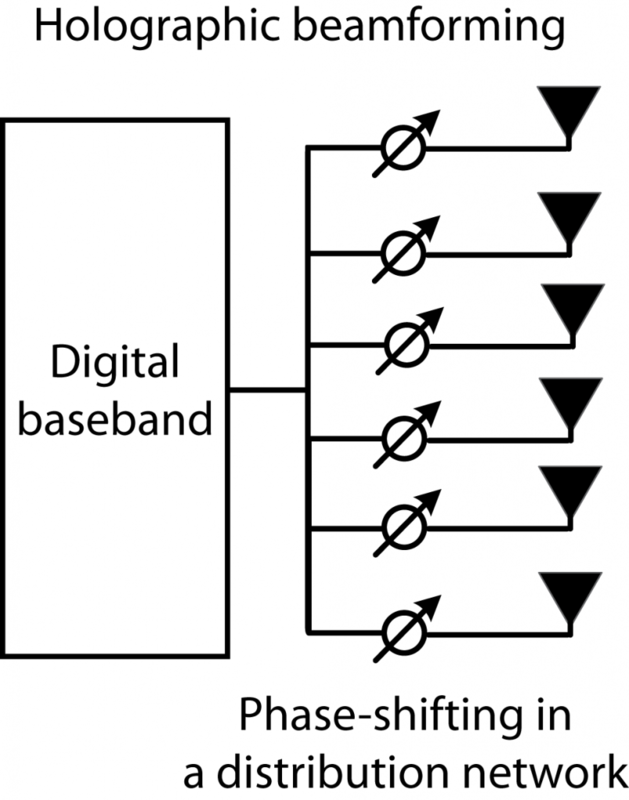 With a single RF-input, only single-user single-stream beamforming is possible. As explained in Section 1.3 in my recent book, such single-user beamforming can improve the SINR, but the rate only grows logarithmically with the number of antennas. Nevertheless, cost-efficient single-stream beamforming from massive arrays is one of the first issues that the industry tries to solve, in preparation for a full-blown Massive MIMO deployment. The largest gains from multiple antenna technologies come from spatial multiplexing of many users, using a Massive MIMO topology where the inter-user interference is reduced by making the beams narrower as more users are to be multiplexed. The capacity then grows linearly with the number of users, as also explained in Section 1.3 of my book. Can holographic beamforming be used to implement Massive MIMO with spatial multiplexing of tens of users? Yes, similar to hybrid beamforming, one could deploy an array of PESAs, where each PESA is used to transmit to one user. Eric J. Black, CTO and founder of Pivotal Commware, refers to this as “sub-aperture based SDMA“. If you want the capability of serving ten users simultaneously, you will need ten PESAs. If the C-SWaP of holographic beamforming is as low as claimed, the technology might have the key to cost-efficient deployment of Massive MIMO. The thin and conformable form factor also makes me think about the recent concept of Distributed Large Intelligent Surface, where rooms are decorated with small antenna arrays to provide seamless connectivity. Hi Emil and thank you for your great videos on YouTube. I have a tough question for you. If two identical UEs are at the same location their channels to the BS should be identical, you’d expect. How can the BS dicern this and how will the beamforming or DL data transmission work for each of them? How can interference be avoided in such cases? In such a case, the BS cannot separate the users, since their channels are identical. But that case will never happen in practice. The antennas of the two UEs will be physically separated and hence the channels will be different, even if the difference can be small. This is all you need to separate the users. The larger the difference, the less you will lose in the desired signal power from canceling interference.